I am a fan of the Empower screen and the Myview with the Coach and Temperature gauges. That's what I use too. I keep the Empower screen up, but I also set up a MyView with RPM (left) and Temp (right). I check the MyView occasionally to monitor the engine. Edited by stevedebi, 11 January 2016 - 08:40 AM. I show the tach on that left side gauge. Let's me know if/when the ice is on. Cool - thanks for the responses! I drove to work today with the Empower screen up on the left side. I was in EV mode. What does the blue line segment mean that overlays the Kw/h side of gauge mean? I was thinking that maybe this is the cars way of telling me to keep my Kw/h consumption within this range if I want to make it to work under EV power. Is that right? I'm also curious about this "My View" thing that stevedebi mentioned. He makes it sound like My View can be configured to show different things, but I couldn't see how to do this... It's not possible to have Empower AND My View up at the same time, right? You know, when the ICE is on, the KW Gauge will be white and showing some value? ICE shows up on all the gauges that show the KW, including Engage. There is a blue box on the Empower guage. It shows the level at which the engine will switch to ICE. When on ICE, it represents the level at which the car will switch back to EV. On the MyView gauge, use the right arrow > key to configure the gauge. Both the left part and the right part can be changed. The key part of the Empower screen is the KW guage on the left, showing the power being used. That can be configured on the MyView, and is what I normally have there (except when doing long distance highway driving). 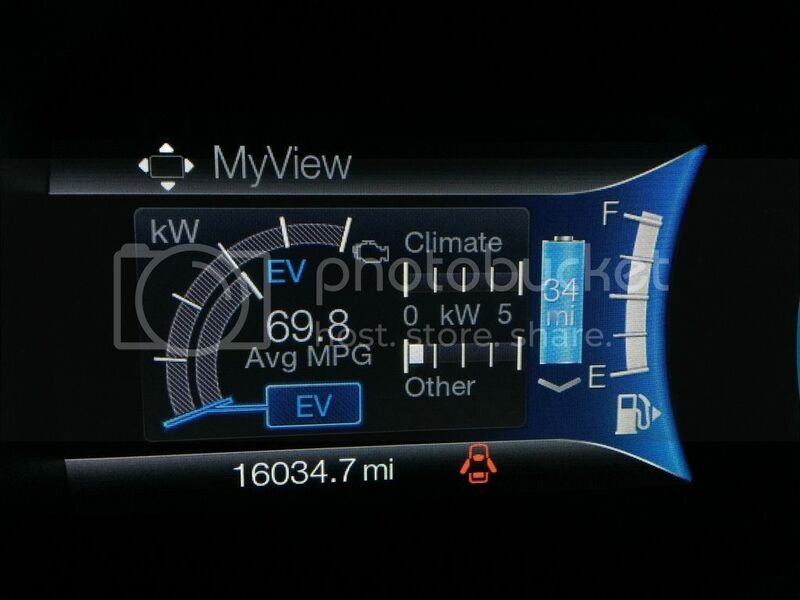 EDIT: But no, you can't have the entire Empower screen (KW used and MPG) up at the same time as the MyView. Edited by stevedebi, 12 January 2016 - 09:26 AM. Awesome! Thanks for explaining. Going to experiment with this on the way home. Thanks to your comments, I was able to figure out how to customize My View. I tried stevedebi and ptjones' setup but I don't understand why the temp gauge is a useful thing to display here? I'm sure its all just an individual preference and goals thing. My goal is to more clearly see my Mpg along with something that helps me to visualize how hard to press the pedals in order to maximize EV time. That goal led me to select "Power + Threshold" on the left and Coaching on the right. I'm not totally sold on the Power + Threshold gauge. I sort of like the one that shows an engine ring next to the Kwh gauge (Split Power?). With Empower Gauge you have on right side it shows Power + thresh hold, White ICE is on, Blue EV is working and right side instantaneous MPG's and Brake Coach. That is what I use, I also have a ScanGaugeII to show IT, WT, TFT and SOC. I like using the temperature gauge in the winter. I allow the engine to warm up a bit before turning on the heat. I also have a ScanGauge where I can monitor the coolant temperature and have found that it needs to be 130ºf or greater to minimize use of the the HVB for heating the coolant. Running in EV and using heater will draw maximum power and will only reduce the heater load once the coolant gets to around 130ºf. In real cold weather the heater will likely never reach a point where the power is reduced. Needless to say I would rather use the HVB power for the motors rather than heat. When I really need more than the seat heaters, Hybrid mode works best to get the cabin warm. As I sit here trying to patiently wait a week to pick up my(new to me) 2013 C-Max, I was contemplating this scenario of EV vs Auto EV this morning for my cold commutes. -Best route I believe is the county route which is mostly a clear 2 lane downhill. Also probably only going to have a 120V charger for some time. and I don't have a regular enough schedule to accurately set go times. My thinking is that I'm likely going to use the remote start when I'm in the last ten minutes of heading out the door. And that the best would probably be to just use EV. From what I'm hearing from others I'm guessing I might just make it to work this time of year on the downhill trip on EV only. Then comes the question of whether I can find some place to recharge while at work. Unfortunately trying to plug in at work would mean an extension cord or two across an alley where lots of school kids go through and like to make mischief. So likely not. So, Auto EV if no charging before heading home unless I somehow end up with a bit of EV left to start the trip in town before getting to the 55mph section. Wouldn't I be better off just using EV till depleted? (I'm assuming I'm not likely to make it uphill 13 miles in 15F weather with the climate control and lights on and driving through some snow.) Then the ICE would only kick on for a bit at the end. (though hopefully early enough to get warmed up before I get home and want to shut off). If I were to use Auto EV, wouldn't the end result be the ICE running more often and using more gas? I'm assuming in Auto EV it's somewhat similar to my Prius in that the ICE will start and run until it's warmed up, and then it will restart as needed to keep the temps up? Which in this weather at 55mph means it's going to need to restart frequently just to keep the temp up. Or am I missing some pieces? NOTE: I also have a Scangauge II installed with (typically) Battery SOC, Battery Temp, Interior Temp, and Instant Gas Economy meters displayed below it. The temp gauge is useful when on the highway, especially in the summer. I like to keep tabs on the engine temp here in the desert. As others have noted, it is also useful in winter to know when the ICE is up to temp, for use with the heater. The Energi has two heaters. The electric one uses a LOT of EV power. The ICE one only works when the engine is running (like on the highway or in hybrid mode), but does not deplete the batteries since it uses engine heat. LOL, your profile says "southern plains" and then south Texas. I'm a Texan myself by birth. I may consider switching to that one one the left. But for me, I generally don't worry about the ICE use when I'm in EV (when the right display is most important), and I only use that MyView when in EV. So I'm not sure I need both ICE and Electric KW meters. EDIT: I didn't realize that the doors could be open and still see the left side. On my 2014, when a door is open there is a message covering that display. Edited by stevedebi, 14 January 2016 - 10:14 AM. This could just as easily be it's own thread, or in one of the cold weather threads. My commute is about 15 miles, and the temperature lately has been between -10F and +5F. I use 120V L1 charging at home, and 208V L2 charging at work. I precondition at both ends and keep my climate control in the low 60s. I don't make it on 100% EV. Generally it runs 75-85% EV, unless oil maintenance mode kicks in, then it's much worse. This winter, oil maintenance mode seems to kick in about every other week and lasts for 1-3 days of commuting depending on the route I drive, and whether the grills are blocked. At temperatures close to 0F, with no preconditioning and remote start parameters set to Auto, your car will almost certainly start the ICE within a minute or less of when you remote start the car. If you adjust the parameters to prevent the ICE from starting, at the end of 10 minutes on remote start you may have consumed as much as 15-20% of you battery. My Experience is that you won't be likely to make your commute on all EV with the climate control set to 60F. I'm not sure whether running in Auto vs EV will have any affect on the amount of gas you burn. I've experimented with it and now I tend to leave it in Auto and let the car start and stop the engine as it sees fit, but I think this may be contributing to the car dropping into oil maintenance mode so often. This winter, oil maintenance mode seems to kick in about every other week and lasts for 1-3 days of commuting depending on the route I drive, and whether the grills are blocked. Interesting. I hadn't realized there was a temperature component to the oil maintenance mode(Or at least that's what it sounds like from your description). Does preconditioning ONLY use what power is available from the EVSE to warm the car? Does remote start not use ANY EVSE power that is available? Or does it just use much more power than is available from the EVSE? Can preconditioning be set on short notice? Like would it work if I set the preconditioning from my phone to start in 5 minutes from the present time? I think what triggers oil maintenance mode is running the engine in short cycles that just warm the engine to a nominal temperature before turning off. To get out of oil maintenance mode seems to require getting the engine up to full operating temperature and holding it for a while. This can take a long time if you are putting around town on city streets in very cold weather with no grill blocks. It clears much quicker driving at freeway speeds, with the grills covered. This was the main reason I covered my grills. Preconditioning only uses EVSE power to warm up the car, so it can safely be done in a closed garage. This is good to minimize gas usage, but it takes time and is not as impressive on 120V as it is on an L2 EVSE. Remote Starting will use the EVSE power, but will also draw down the battery as it runs the climate control at full power to warm up or cool down quickly. Under certain combinations of conditions and settings, remote start will start the ICE, so be very careful about using remote start in an enclosed garage. 120V preconditioning in very cold weather will not often reach the set point, but it does take the edge off the cold and allow the car to drop off of 5+kW of climate control power demand much more quickly than with no preconditioning.